Seven inches of snow, sleet, ice pellets and rain is on the way. Temperatures hover in the 30s. We haven’t seen the sun in days. But dag’gammit, the new honey bee hive hosts have bee hives in their backyards! Thanks to everyone who decided to host a hive this year. I know the permit process is a long and arduous task. Your love of honey bees saw you through, and now you’re hosting your very own hive. A thousand thank yous, and tens of thousands of thank yous from all the honey bees that have a place to live! 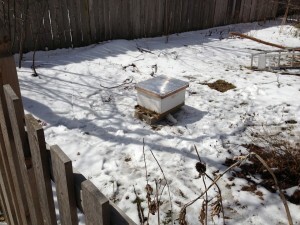 This entry was posted in Hive Hosts, Honeybees on April 18, 2013 by skinny_jake. Bee Bearding — it’s a real thing.